30-minute Spinach, Mushroom and Cheese Casserole: These no-fail cheesy treats use only 4 ingredients and are chock full of green leafy spinach and mushrooms for your daily dose of vitamins, iron and calcium! A quick, easy and yummy way to get kids to eat their greens! This is another dish that I learnt from my Mexican friend who taught me how to cook the Mexican Rice with Stewed Beef Shin. I am so blessed to have friends from all over the world who are good cooks, and love their families so much that they would spend hours whipping up the best dishes for them. Food is always the topic that we talk about when we meet. I usually make one large casserole when I am cooking this at home. But if you are doing a party, you can also make them into mini casserole canapes for your guests. They look great and taste taste too! These delicious spinach, mushroom and cheese casseroles are chock full of vitamins, iron and calcium. Can you see all the ‘hidden’ spinach underneath the layers of cheese? 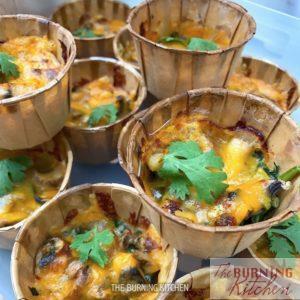 Its a really great way to get kids to eat their greens as kids usually love anything with cheese and mushrooms! Moreover it is baked, not fried, so its a healthy alternative to other fried finger foods usually targeted at kids! Best of all its so quick and easy as it only uses 4 main ingredients and takes 30 minutes to make. 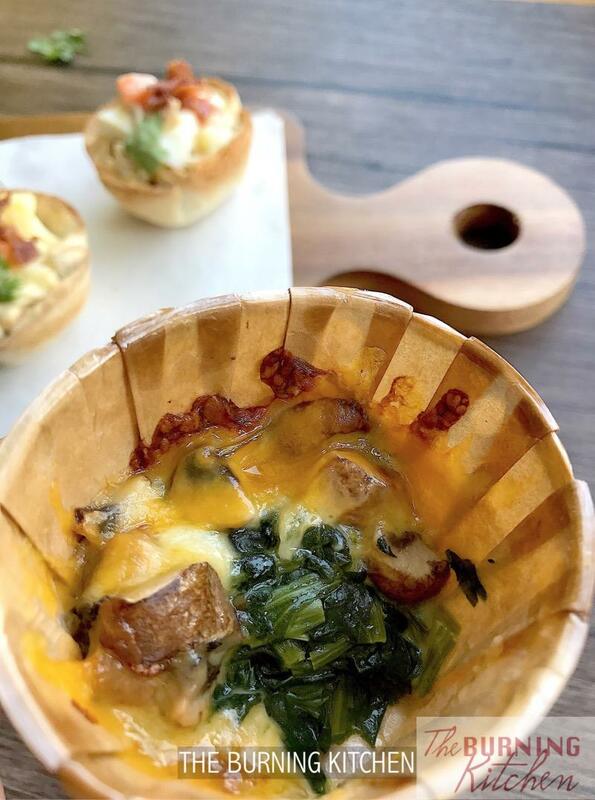 These no-fail cheesy treats use only 4 ingredients and are chock full of green leafy spinach and mushrooms for your daily dose of vitamins, iron and calcium! A quick, easy and yummy way to get kids to eat their greens! Clean the mushrooms using a soft-bristled brush to lightly brush off any dirt from the mushrooms. Then slice the mushrooms thinly. Shred the cheddar and mozzarella cheese (you can also save time by buying pre-shredded cheese). Set aside about 3/4 bowl of cheddar for the top layer, and mix the rest of the cheddar with the mozzarella. Put all the chopped spinach into the pot to blanch for about 10 mins. Once blanched, pour the spinach through a metal sieve or colander and drain dry. Take a large oven-proof deep dish, and add in about 1/3 of the spinach on the dish as the bottom layer. Next add a layer of mozzarella and cheddar cheese, followed by a layer of mushrooms. Repeat this 3 times. Lastly add in the 3/4 bowl of cheddar cheese over the top layer. Place the dish into the oven to bake for about 10 mins at 180°C or until the cheddar cheese is golden brown. Serve while it is hot. Don't cook the spinach for too long otherwise it will be soft and turn yellow (not more than 10 mins). Avoid washing the mushrooms before cooking them, otherwise they will absorb water and turn soggy during cooking. Instead, use a soft-bristled brush to gently brush off any excess dirt. The mozzarella gives the stretchy cheese layers, whereas cheddar adds a more savoury flavour and browns better in the oven. For the layering, I usually combine the cheddar and mozzarella together for a good balance of flavour and stretchy texture, but the top layer should be mainly cheddar to give that golden brown finishing. You can also serve these as mini casseroles using grease-proof muffin cups, but you may only be able to make 1 or 2 layers instead of 3. This recipe makes about 12 medium-sized cups.